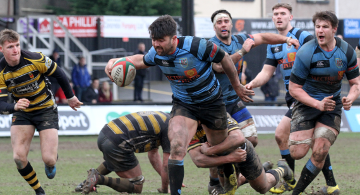 It's been a superb season so far for Cardiff RFC, and they could make it even better on Saturday afternoon when Bedwas RFC arrive at the Arms Park for a WRU National Cup Quarter-Final. The Blue and Blacks are currently second in the Principality Premiership, just two points behind top spot Merthyr and 10 points ahead of third placed Pontypridd, having lost just four games all season. The current run of form is quite remarkable, with the last defeat coming on the 8th December at Ebbw Vale, meaning we are unbeaten in 12 games and have actually won every game played so far in 2019. Cardiff haven't actually lost at home in any competition since the first day of the season, when Merthyr won 18-24, giving the Arms Park a fortress-like feel. So far in the WRU National Cup it has all been on the road though for the Blue and Blacks, with away games at Championship side Tata Steel and up to North Wales to face RGC, but now it is time to return home. On the current run of good form Bedwas, who have beaten two lots of Championship opponents in Rhydyfelin and Cardiff Met, have already been defeated at the Arms Park, with tries from Morgan Allen, Will Rees-Hole, Tom Williams and Ben Thomas (2) leading to a 35-17 win. Picking his team for this weekend, head coach Steve Law has largely kept faith with the XV that started in the win over Aberavon last time out, as the only change sees Llywarch ap Myrddin come in for Ed Howley at full-back. On the bench there are recalls for Fraser Young, Zach O'Driscoll and Max Llewellyn, with Callum Bradbury, Jim Botham and Ben Thomas of the Cardiff Blues academy in the starting line-up. If you liked this piece and want to contribute to the independent voice of Cardiff rugby then you can join us here. As a member led organisation we want to hear from you about the issues you want us to raise. Bluenblack53 on A new dawn, or a false dawn? Joseph Wilson on A new dawn, or a false dawn?